Écosse is a combination of four of the National Capital Region’s favourite musicians. The (thankfully) ubiquitous James Stephens does what he does best: he plays a dozen or so instruments, adds his wonderful voice and, with Duncan, directs the musical flow of the band. James will be remembered by many for his time with legendary Ottawa groups Fat Man Waving and Six Mile Bridge. 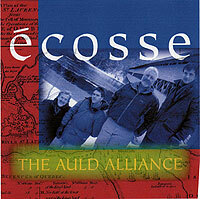 He recorded, engineered and helped produce Écosse’s new album (The Auld Alliance) at his Stove Sound studio in Chelsea. Duncan Gillis is another of the region’s brightest lights. Former bands include the brilliant and extremely popular Jimmy George. Duncan cut his musical teeth amongst the pipe band community and in countless sessions and groups over the years. He is an incredible piper and flute player who also adds his fine vocal talents to the mix. As well as all of the above, this new album highlights Duncan’s own invention, the Highland hornpipe, which is an integral part of Écosse’s sound. This motley crew is held together and indeed driven on by the wonderful drumming and percussive talents of Rob Graves, whose world beat rhythms add a decidedly exotic flavour to the Celtic and Québécois influences of the band. Stirring songs and melodies, exciting and very danceable tune sets, and a very highly defined sense of joie de vivre are what you can expect at an Écosse concert. Bring your smiley face! To purchase securely online go to CD Baby at http://www.cdbaby.com/cd/ecosse. To order by mail (the artist makes a better profit!) please contact us for shipping rates to your address, or calculate shipping yourself at the Canada Post web site. Canadian residents may send personal check or money order (Canadian funds only, $20 per CD, plus shipping) to: Bobby Watt, 15 du Parc de la Pêche, Ste-Cécile-de-Masham, Québec, J0X 2W0 Canada. American residents send international money orders only please. Please contact us by e-mail for overseas orders.